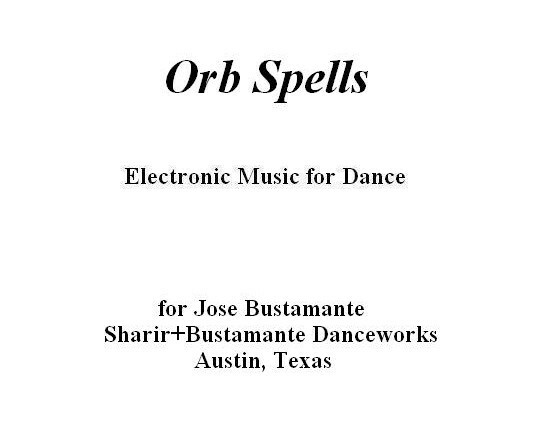 Orb Spells (2004) was commissioned by José Bustamante for Sharir+Bustamante Danceworks, of Austin, Texas. It is in 5 movements, entitled Astrolabe, Eclipsis, Stella Octangula, Trine, and Pulsar. Several of the movements are based on Indian tabla tals, the most prominent of which are the 17-beat Shikar tal, used in Eclipses, and the 16-beat Amad, which forms the basis of Stella Octangula. The pitch material in Astrolabe and Stella Octangula is also indebted to Indian music, specifically the scale of the Hamsadhvani raga, although the harmonies and transpositions are definitely western. The percussive sounds have a tabla-like quality, which is intentional. However, they were actually derived from various common household objects, such as empty milk jugs, plastic containers, and cardboard mailing tubes.